DMK president M. Karunanidhi on Thursday sought to make a case for the formation of a separate ‘Tamil Eelam’ drawing parallels with Kosovo, South Sudan, East Timor and Montenegro, all nations that have come into being in recent years following the United Nations’ intervention and referendums. “The song of freedom is ringing in the ears of Tamils across the world. The blood and tears shed by Sri Lankan Tamils will not go in vain. If not tomorrow, it will come into existence one day,” he said in a statement here. “At a public meeting on the Marina sands the next day, I said if the Indian Army entered Sri Lanka to create a Tamil Eelam, the Congress could rule the State and the DMK would not make efforts to come to power for the next 10 years,” he recalled. He said though the then Sri Lankan President J.R. Jayawardene agreed [in the Indo-Sri Lanka Accord of 1987] for a referendum on whether the Northern and Eastern provinces should be merged, he later vowed to campaign against the merger in the event of a referendum being actually held. The DMK leader said Sri Lankan Tamil leader SJV Chelavanayagam changed the name of Tamil United Front to the Tamil United Liberation Front in the 1976 conference in Vaddukottai with the objective of achieving a separate nation for Tamils. 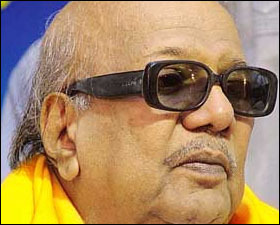 “Unfortunately, he died in a year,” Mr. Karunanidhi said. All these politicians are opportunists. They are not sincere in their commitment. They were taken for a ride by the Zionist Americans who promised them devolution to the Northeast after consolidating MR as the leader for the South allowing MR to mop up the thirty year war under thirty months, inspite of the NE being mined heavily fortifying the LTTE strong holds which will take another ten years to clear. So the LTTE closed the Mawilaru Anicut and drew the govt. forces to a staged war closing the stage for all including the UN and Independent observers to cover the truth. During this period all these individuals from Tamil Nadu kept silent when the MR regiem drummed to the whole world to hear that they were thrashing the LTTE out of sight, because that was the strategy the Zionist Americans laid out as a game plan. These Tamil Nadu leaders not only have been deceived by the promise of devolution but also unaware till the remaining 40 thousand LTTE and civilian population were decimated by the MR’s forces, after the LTTE had buried their entire armoury. Now these Political Catchers having lost on the promise are unable to reveal their complicity in the exercise and are trying to cover their guilt of silence then, by appealing for an Tamil Eelam now. if so the global power game will take place in Sri Lanka.